Residential fences can serve a variety of purposes. 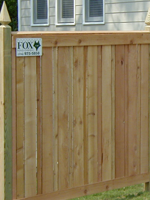 Children and dogs are by far the single greatest reason that families have a fence built by Fox Fence Company. But there’s so much more to consider when installing a fence than just keeping your kids safe or containing your dog. That’s where our nearly 25 years of experience in the fence business pays off for our customers. We will guide you to a fence design that meets your needs and budget. We’ll also help ensure that your new fence meets subdivision requirements, local codes, stays within property line boundaries and most important, adds value to your home. We can provide just about any type of residential fence from simple galvanized chain link, to elaborate custom wood, to ornamental aluminum or steel. Whatever style you need to create the backyard of your dreams, we can do it. We carry a complete line of chain link in different colors and sizes. Our wood shop can create just about anything you can imagine in several different wood types. Aluminum and steel ornamental have many options in size, style, color and adornments. If you have an existing fence that has outlived its usefulness or your fence needs have changed, we can remove your old fence, haul it off and replace it with a new Fox Fence. If your fence has been damaged or just needs some adjustments, we can repair or replace parts or the entire fence.